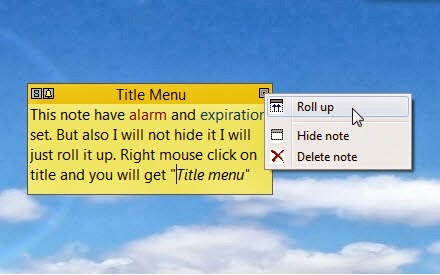 Maybe you know maybe you not about "Title menu" and "Close menu". I've created one simple note to show you those two menus. So now when I have note created I will show you both of them. When you right mouse click on a note title you get "Title menu" like this one on the image below. As you can see I set alarm and expiration on this note. 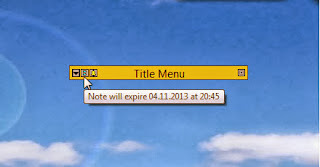 Now you can see small and simple title menu. 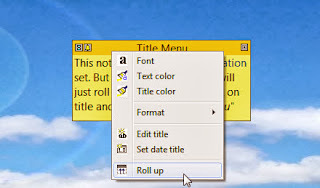 Here you can edit title text, select title font and set title text color. Also cool item is "Roll up" I hope you know what is this. "Roll up" shortcut is to double click (left mouse) on the title. Later you will see image of this note rolled up. On image above you can see "Close menu" which you get when you click on small square icon located on the title right. 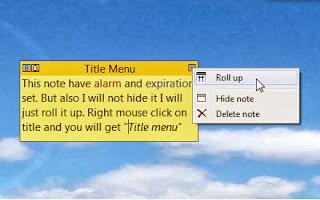 Same as on previous menu you get "Roll up" item with "Hide note" and "Delete note" items. If you didn't know you can remove this menu in the program settings, under "General settings" tab. There you have two questions regarding this close icon and close menu. 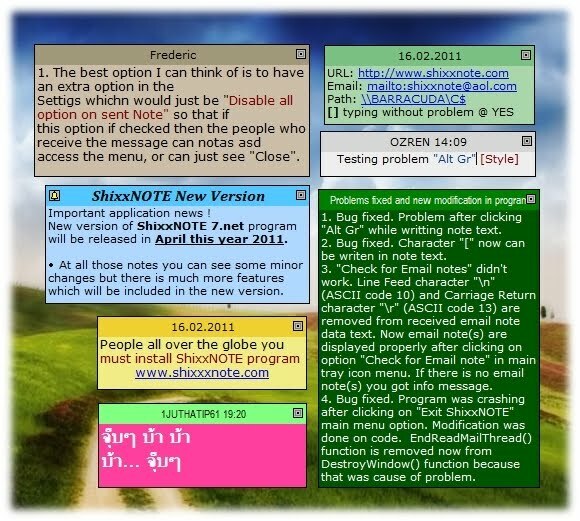 "Show close button in the note title right corner" default is "Yes" and "Disable menu on note close button click" default is "No". This are default settings but you can change it and remove close icon or just remove close menu. Your choice. If you like default settings then like me I click on the "Roll up" menu item and get this image below. Now my note is rolled up. But you can see note title text, also info about alarm and expiration if you move mouse under alarm or expiration icons. Also you got now "Roll down" icon and in the "Title menu" note there is "Roll down" item now. 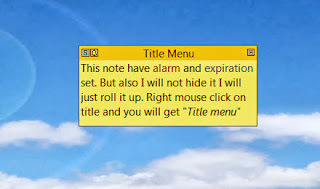 That is all you have to know about title menu and close menu. I hope you are satisfied, because maybe you learn something you didn't know.